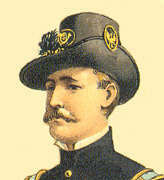 The adoption of the Jeff Davis hat posed the problem of how to make the hat look military. One solution was to use the eagle design that was worn on the front of the cap (shako) as an insignia to loop the side of the hat up. 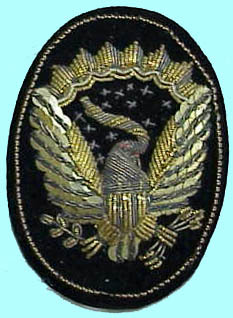 These eagles saw service 1858-1871. They were among the more beautiful creations of the embroiderer's art. The above eagle was worn by Lieutenant Colonel William H. Silsby of the 10th Iowa Infantry.